Set comes with 4 foundation puffs in 2 different shapes. Expect: (2) Hour Glass Shaped Puffs in Blue and Pink and (2) Tear Drop Shaped Puffs in Beige and Lavender. Shapes are ideal for all types of makeup application. Each sponge is approx: 2.25″ x 1.5″ x 1.5″ (L x W x H). You don’t have to any more, this set comes with tools that you won’t regret picking up! This set will help you put makeup on like a pro and comes with 4 sponges that will assist you with full, medium or light coverage leaving your makeup flawless, dazzling and undetectable! Each set comes with (2) Hour Glass Sponges in Pink and Blue and (2) Tear Drop Sponges in Lavender and Beige. 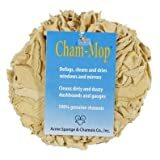 Cham-Mop, All Purpose Genuine Leather Clean Up Chamois, Ideal For Windows & Car Washing, Cleans Up Moisture In No Time, Super Absorbent, Extra Gentle On All Types Of Surface Materials.